Camera collectors and historians across the world will be saddened by the death of Eric Evans on 26th October 2016, only a few months after being diagnosed with inoperable cancer. Eric was a committed Socialist and a strong believer in education for all. 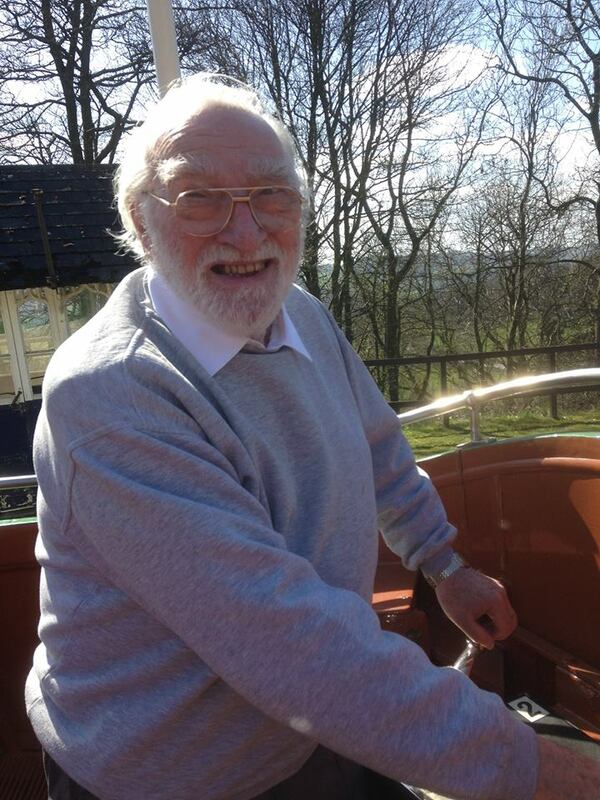 He led an active life combining work as a teacher, an advisory teacher and visiting lecturer at the universities in Sheffield with playing in a brass band and in both codes of rugby as well as using his photographic skills to illustrate his articles for motor caravanning magazine MMM. 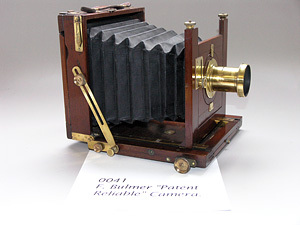 Eric had been a casual collector for many years, and after losing his beloved wife Maureen in 2005 he found a new focus to his life by setting himself the daunting task of collecting cameras from every maker listed in Channing & Dunn’s book “British Camera Makers”. Like everything Eric did in life he approached this task with great dedication and he amassed a large collection of over 180 different British makers, including a significant number that were not listed in C & D.
In addition to the articles he wrote for several photographic magazines, Eric’s passion and expertise for wood and brass cameras became well known across the world through this web site and his contributions to the Internet Directory of Camera Collectors. Many collectors visited Eric to view his wonderful collection and passed many hours in conversation sharing his abundant knowledge, experience and humour. Eric leaves behind a family in whom he had great pride and who, like many many others will miss his warmth, intellect, wise words and gentle encouraging manner. 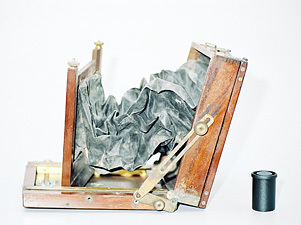 For conveniently indexing this site, the two most often encountered styles of 19th Century wooden folding cameras, the 'Tailboard' Style and the drop baseboard 'English' style, have been chosen, as these two types form the greater part of the body of work from the 19th Century camera makers, and of my collection. 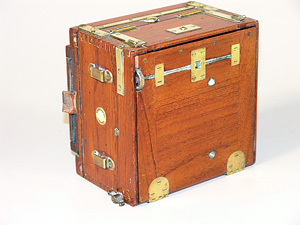 The theme of the collection is meant to be 'British Wood and Brass Cameras before 1914', and it is my aim eventually to have at least one example of the work of every British camera maker from 1839, when the camera as we know it was first used, to the beginning of the First World War. I have already strayed from my self-imposed remit by including 'interesting' examples from the 1920s, and even the 30s. 'Interesting' is one of those weasel words used by us collectors to justify and give wiggle-room for buying an item just because we fancy it, even if it has no rightful or logical place in our collections. Other collectors will recognise the syndrome; there is no need to labour the point, nor essentially to apologise for it. So, included here, are cameras from America, France, Germany and possibly Italy... 'possibly', because I am not too sure whether the Italian one came from France... keep up! Camera collecting is not an exact science. More of a fine art, really, but where known aberrations do happen, I have noted the fact in the description. Why do I do it? I don't know, and in my experience not many collectors do. If I live long enough, I may in a small way be able to call myself a craftsman. But craftsman, in the case of wood and brass cameras, meant making, by candle and gaslight, lovely little dovetail joints so small you can hardly see them, or polishing screw heads that are not only precisely lined up with each other but also precisely flush with the surface of the wood or brass they are set in... and, well, that skill may take me a little longer to acquire than I have got left. I don't know anybody else alive today who can do those things either. They may exist, I just haven't met any, and at 77 years old, I have met an awful lot of people. So, I am attracted to such skill in the cameras I have chosen to look after during my lifetime. There will never be any more like them. The mould is broken. That's probably why I feel the need to look after what is left, even if at times it costs me everything I have and a bit more. I've never sold a camera in my life. I just collect them. I do restore cameras. 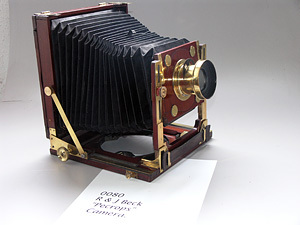 The collecting lobby is split between those who do restore and those who don't, and I am able to see arguments for both views, but at my level of finance for my collecting, I frequently have to buy cameras that are barely recognisable as such. Really. 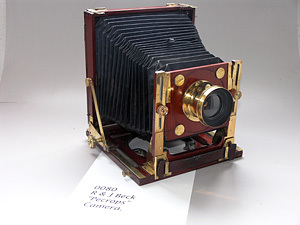 In at least one case, I was given a handful of mahogany splinters, painted black all over, but hey, for all I knew it could have been the last surviving example of that camera, so what could I do? Stand on purist principles and throw it in the dustbin? No way. Another camera I obtained was stinking with animal urine from a stable find, another had the bellows eaten away by mice and rats, yet another was riddled with woodworm. I turn nothing away that is looking for a home. 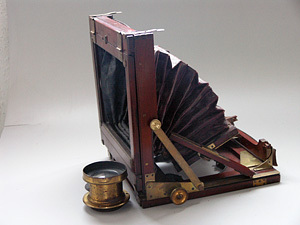 So, I pay my respects to the long dead craftsmen who made them by making their cameras as good as I can. But if it is best left alone, I leave it alone. If you can tell from the pictures, without my telling you, which cameras have been restored, I'll be very surprised. I'll also be a little upset because, like I said, I hope to be a craftsman some day.